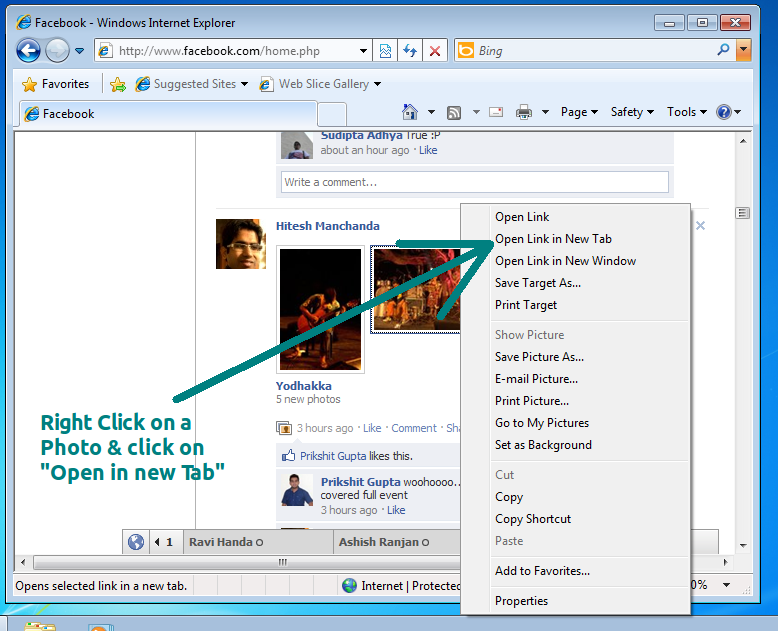 How To Disable Facebook Lightbox Photo Viewer In Internet Explorer? Facebook recently rolled out the new Lightbox photo viewer which appears as a popup right inside the page. Although some users may like it, many others have have not liked this new feature in Facebook. We have already told you how to disable the Facebook Lightbox Photo Viewer in Chrome And Firefox. In this article we will tell you how to disable the Facebook Lightbox photo viewer in Internet Explorer. 1. Editing the URL: The new URL structure of Photos on Facebook have a "&theater" in the URL. All you need to do is manually remove the &theater from the URL and visit it. 2. Another method to disable the Facebook Lightbox Photo viewer in Facebook is to right click on any photo and open it in a new tab or a new Window. This is a permanent method of disabling the Facebook Lightbox Photo Viewer in Internet Explorer (IE). Here is a screenshot to illustrate the technique.